At work, they keep scary things—like illegal drugs, terrorists and their weapons—out of the country. But last weekend, Chapter 160 (Customs and Border Protection, Brownsville) had some spooky Halloween fun with local kids. The chapter hosted a tent at a special law enforcement “Boo at the Zoo” night at the Gladys Porter Zoo, in Brownsville, Texas. 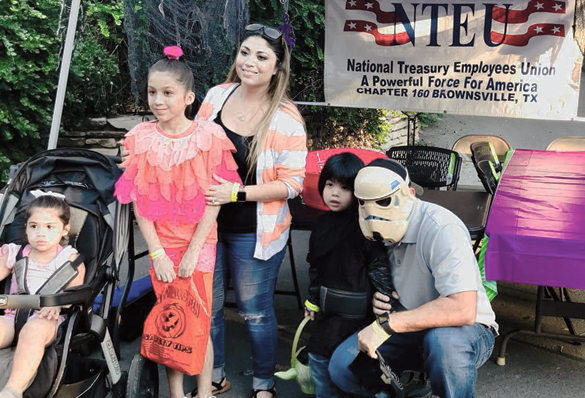 Along with providing a safe place for law enforcement families to trick or treat, the event gave NTEU and management officials a chance to interact on a personal level. Chapter 160 leaders Christian Trevino and Robert Hyatt handed out candy to the children at the event, which 400 members registered to attend.